Brush Shampoo - Be Glossy In and Out! I want to tell you about the Brush Shampoo from E.L.F. The make-up brushes have to be disinfected after every use, that`s why we need a very good antibacterial product. Although MAC has also a very good shampoo but expensive, I prefer this one because the price is more than ok and anyway we use it very fast. 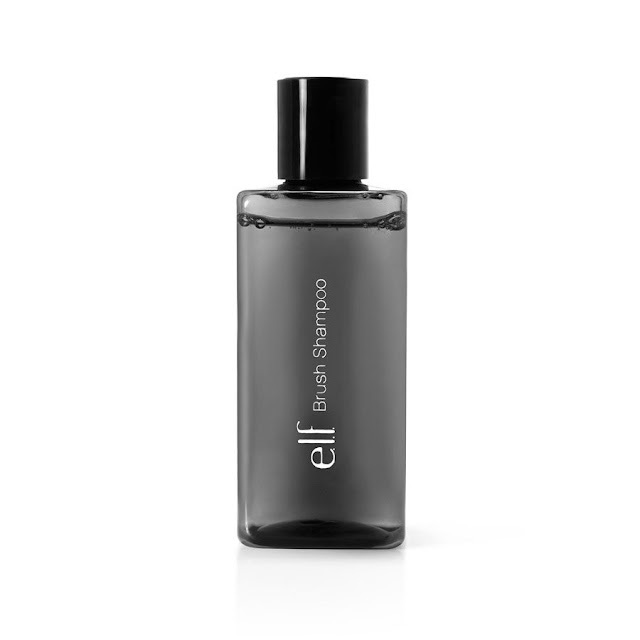 An antibacterial brush cleanser for thorough cleaning in between makeup application. Disinfects brushes to provide a fresh and clean application every time. Washes away traces of dirt, makeup, oil and debris from your brush while conditioning the hair to provide a clean and softapplication for every use. It is a very good product with a accessible price and it makes a good job. Clean the brushes by massaging a small amount of the shampoo with water and working it through the bristle from the base of the brush outward. Rinse thoroughly and gently squeeze out excess water. Reshape the bristles and lay flat on a sterile surface (a clean towel or cloth) to fully dry before next use. It is a very economical product, cause you don`t consume a lot from it every time you use it. I would prefer, though, the opener to be a little larger. I like also that the bottle is transparent, so I can see how much I consumed from it. It doesn`t have a strong smell, cause it doesn`t contain alcohol, but it has a refreshing fade one. Its price is 3.75 pounds and you can buy it from HERE. If you still believe that it`s expensive, you can clean your makeup brushes with hand soap or dish foam. Did you ever try this Brush Shampoo? Or what other similar products did you use? Hi dear! Thanks four your comment! Of course we can follow each other! I'm already a follower! I bought this, but didn't like it much. I prefer to use moisturizing hand soap or baby shampoo. Thanks, I followed back!!! Great blog!!! I heard baby shampoo is really great for your make-up brushes. But, thanks for sharing this new product. Now I'm following you on Facebook!! Agree with the other bloggers too, such an incredibly review! Love the packaging and design of the bottle! I am using the shampoo and then I apply conditioner and rinse, dry them in a towel. eu folosesc sampon, apoi aplic balsam si limpezesc, le usuc intr-un prosop. Did not know there was such a thing as brush shampoo. Looks like a nice product. it is so bad ? I love ELF, their products are so affordable! And this looks like a great idea. Hi dear, thank you for your comment!!! Of course, we can follow each other...we are following you now!!! ofc i wanna follow each other! I bought Laura Mercier brush cleaner and like it! Thanks Alessandra!! I followed back!! No, it,s not so bad:)) You can use hand soap or baby shampoo or dish foam. Thanks a lot Annie!! I followed back!! Love your style! I,m there hun!! Strange you can,t see me. Check the Likes list. Thanks, I followed back!! Great blog!! Thank you for visit my blog, yours is amazing! Great post, I might have to get some of this for my brushes! Thanks for visiting my blog! I'm your newest follower :) I'm excited to have you as a follower too! Hi!I'm following you! I'm use wash my brushes with water and soap, but i believe that's specific products are much better! Thanks for visiting and commenting on my blog today. I'd be more than happy to follow you. I hope you follow me back. I really need to try some E.L.F. products. I haven't done that yet! Hey, I love your blog, I follow you, Thanks your comment in my blog. I'm such a big Elf fan! Post pictures of you wearing it! I would really love for us to follow each other! Let me know if you followed me already so I can follow back ASAP! Leave your link! Thank you for your comment to my blog! Sure I will like to follow each other!I already follow you!Nice post I should try this brush shampoo! Follow my blog back if you want! this was such a helpful post! i was looking for a brush shampoo thank you for sharing this! your blog is great i followed you thank you for your comment it was nice to get in touch! Thanks for the help! I really like your blog! There are always so many precious informations! I'm following dear! Love the review. I really love my brushes but have nothing but facial wash to wash them. Better try this one as it's not really expensive.. Followed you. Care to follow back?